On of the best Batman concepts ever was The Return of Bruce Wayne, where we got Batman placed into various pulp hero stylings, from being a pirate to a barbarian to a cowboy and more. The major flaw of the concepts execution was some of these settings were too cool to only have one issue! I mean how cool would pirate Two-Face be? The Poison Ivy of the Nethanderal man? At least these are the reimaginings of Gotham City my mind walks down. 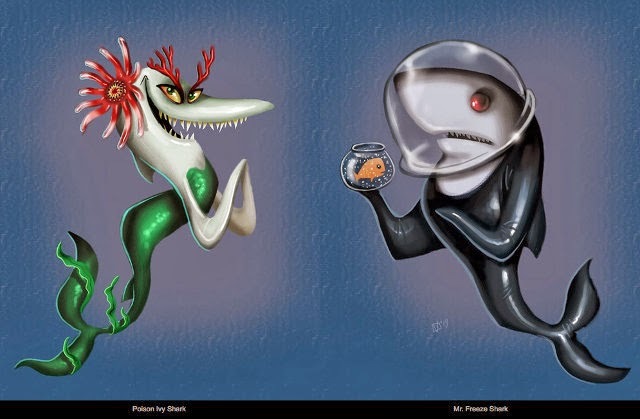 Artist Jeff Victor, he reimagines them all as sharks. Tomato, Tomatoe. 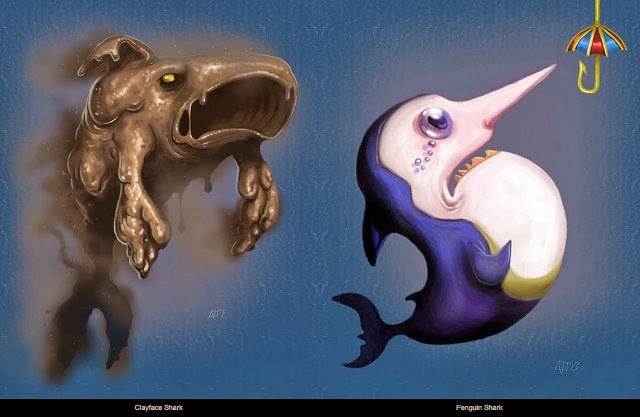 Dubbed Sharkham Asylum, Jeff has also created The Ultimate Pop Culture Alphabet, so is no stranger to tackling infamous icons. While Killer Croc may have been too close to undersea life already to make the mammal make-over, a Ventriloquist shark with a gangster shark puppet, would've just given this stunning range one more set of teeth.